March 20, 2019 (Last Updated: March 21, 2019) - As an Amazon Associate I earn from qualifying purchases. We are going to get crazy with our Detroit Style Pizza series and mash it up with Rueben flavors. That’s right, we are going to take the classic Rueben sandwich and put it on our current favorite thick crust pizza. 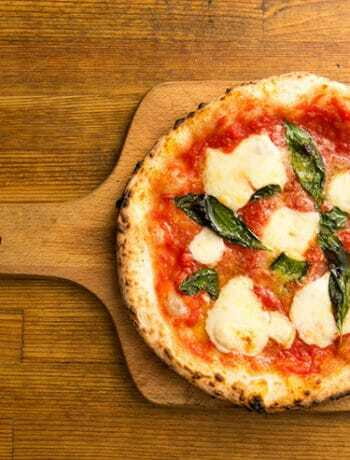 Pizza traditionalists may scoff at this and whether it is technically a pizza or not, but I am a firm believer that you should eat what tastes good. This tastes awesome. So, here we are… not caring if it is technically a pizza or not and putting sauerkraut on our pizza. 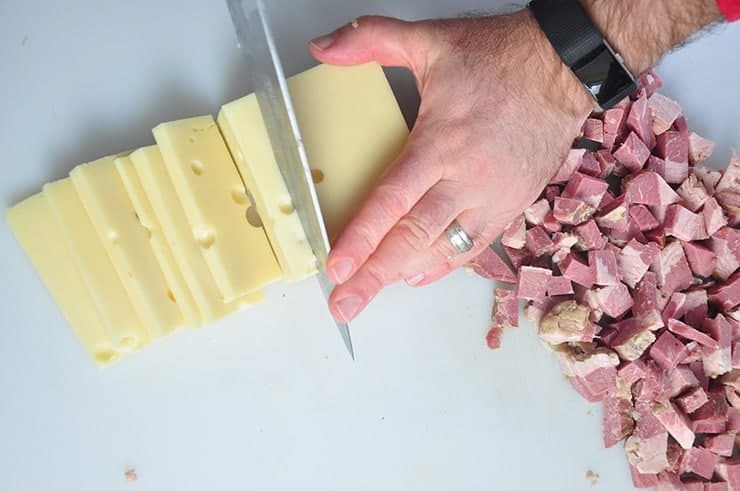 Join us as we make a Detroit Style Rueben Pizza. 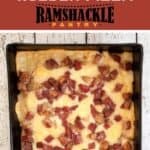 What Makes This a Rueben Pizza? 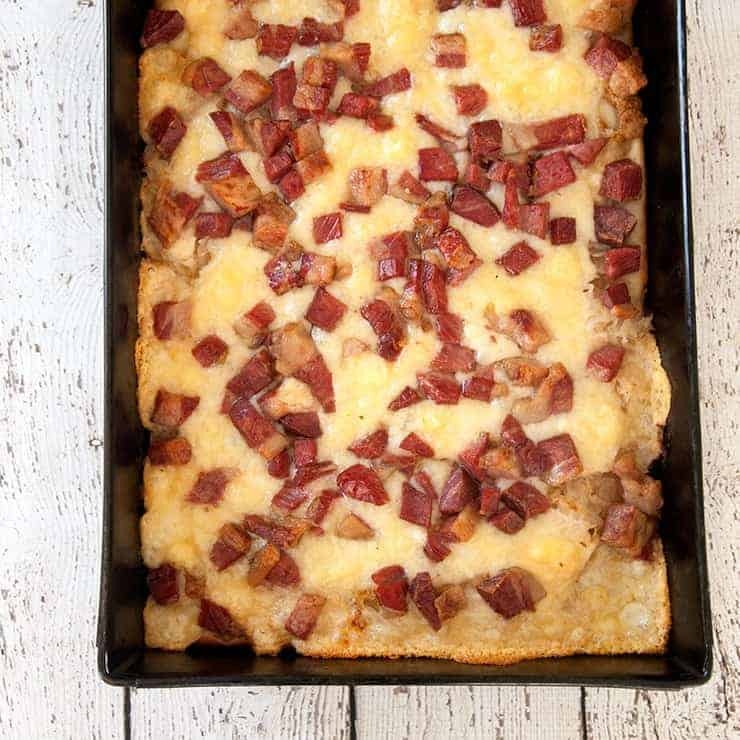 We are not being strict about our interpretation in this Rueben Pizza, but we do have some great flavors on this pizza that are on a traditional Rueben Sandwich. We are adding sauerkraut, corned beef, and swiss cheese to this pizza. I decided to use mustard instead of Thousand Island dressing and there is no rye element to the pizza. To be honest, one thing that inspired me down the Rueben path was a mustard pizza served by a Detroit Style Pizza shop in New York. I decided to make my own interpretation of this pizza and it was fun to explore. So, instead of going full-on Rueben, I decided to use mustard. Corned beef certainly is not the summary of Irish food in America, but it is often associated as such. One of the things I love exploring is history and Irish immigration to Detroit is another thing that inspired this recipe mashup. I often find local dishes by exploring immigration history and Detroit led me in the direction of this pizza mashup. Detroit was an early Catholic city and was an attractive destination for the predominantly Catholic Irish immigrants. The Detroit News reports that this is in large part because of the predominance of Eastern Protestant cities and religious intolerance. Catholic populations and Protestant populations did not always live in harmony and the Protestant majority may have made it difficult to be Catholic in much of the East. So, they moved to places like Detroit. This really is a personal taste, but it does not need much. I use about a quarter of a cup for the whole pizza. And I use a bottle squirt it diagonally across the whole pizza, so each piece gets a bit of the mustard. Part of doing this job involves making mistakes. Mustard absolutely adds to the flavor profile, but one of the mistakes I made along the way was adding too much mustard on one of the pizzas I made. 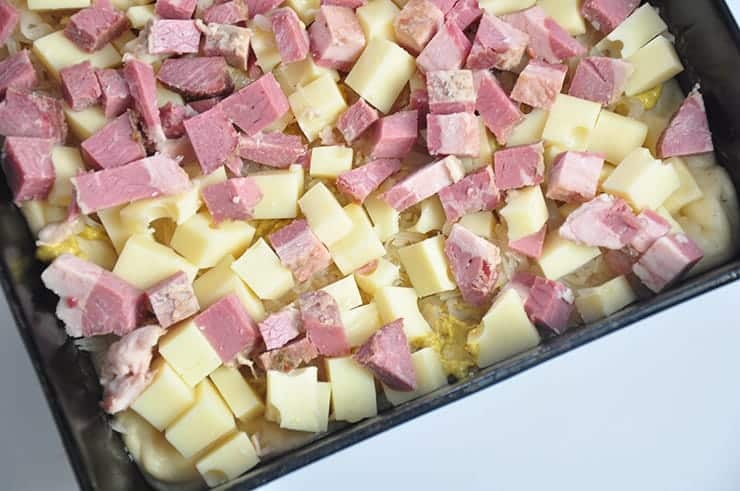 These are really some strong flavors in the pizza with sauerkraut and corned beef and we want the mustard to balance them, not overpower them. If you add too much mustard, you will know. 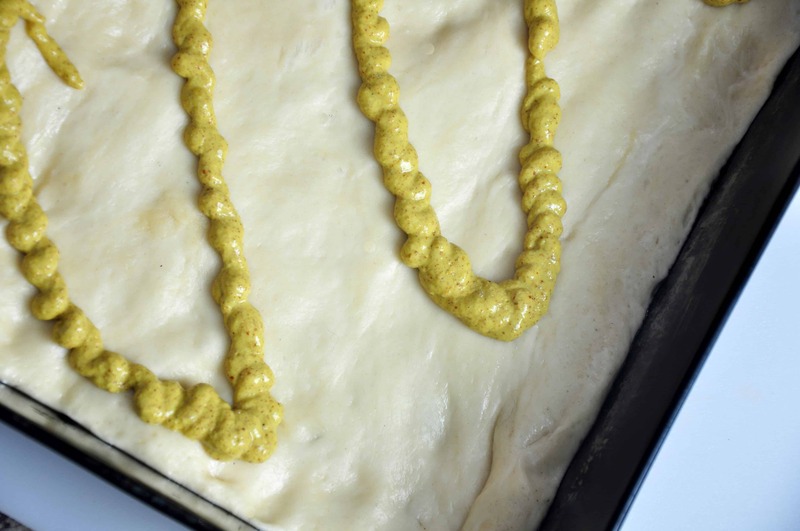 Around a quarter cup of mustard and spread it on the crust so each of the nine pieces get a touch of the sauce. What I did was take my bottle and just quickly squirt it diagonally across the pan so that each piece would get a touch of mustard. Moisture can be an enemy of the Detroit style pizza, so we want to make sure that we have dry ingredients going on to the pizza. So, for the sauerkraut, that means draining it and then using your hand to squeeze some of the moisture out of the fermented cabbage. This is a great way to use left-over corned beef from St. Patrick’s day or whatever reason you made it. I was able to get a few pizzas out of a single roast, plus some left for sandwiches. An alternative to making a whole corned beef would be to get it by the pound at your deli. Honestly, it probably is more cost efficient to just make the roast and get a few meals out if it, with one of them being this pizza! I purchased a 10 x 14 Detroit Style Pizza Pan that makes this style easier to make. The nice thing about this pan is it allows us to cook our Detroit pizza at high temps, but still get a nice crust at the center. Pick up your Detroit Style Pizza pan here! Ultimately, this is a fun pizza to make and you don’t even need to call it pizza if it makes you feel better. 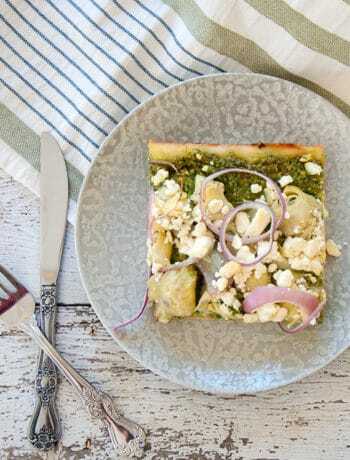 It is a flavorful take on the Detroit Style Pizza that you can make at home! Let me know if you make it and how you like it. If you do, please take a second to share this on Pinterest and sign up to get emailed our latest updates. This Detroit Style Rueben Pizza is tasty and has some great flavors. 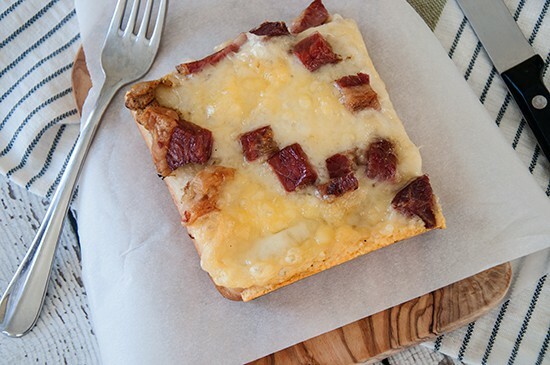 Between sauerkraut, corned beef, and swiss cheese, this pizza is a show stopper. Squirt mustard lightly across the dough, so that every piece will have a little mustard. 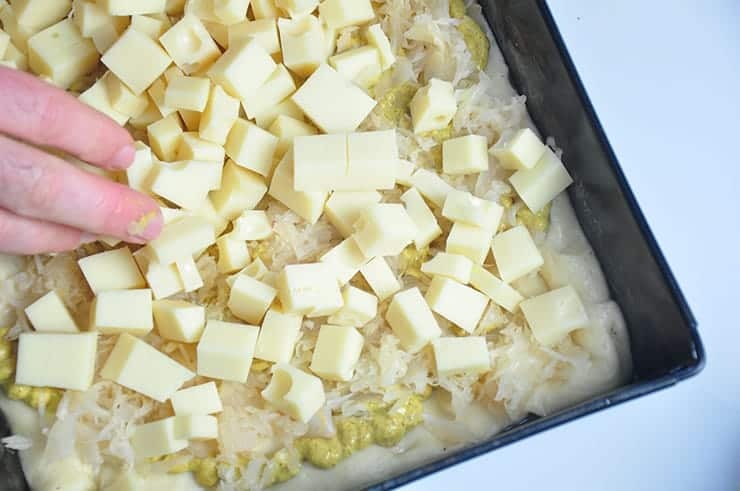 Spread drained sauerkraut across whole pizza. Add corned beef and cheese. Use pizza cutter to cut into 9 pieces.